Back in January, I fell in love with a little book called Forever My Girl. Josie and Liam stole my heart and ran away with it like no other. I didn’t think any future books from Heidi could top it. 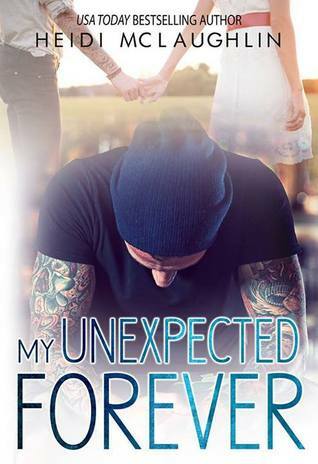 Then came the second book in the Beaumont series, My Unexpected Forever. With this book comes the introduction of Harrison and Quinn. Let me warn you from the get go ladies, hold on to your ovaries! I don’t want her to know she has me by the balls and can string me along like a puppet. We pick up a few months from where Forever My Girl left off. Katelyn has become the band’s manager, and they, along with all the kids, are preparing to go on tour together. Elle and Peyton, Katelyn’s daughters, are still reeling from the death of their father Mason. Ellie clings to Harrison, and Peyton wants nothing to do with anyone. I am telling you, watching children grieve will just shatter your heart. In the midst of all this, Katelyn is playing a cat and mouse game with Harrison. She likes him, but doesn’t want to give in to her feelings because she believes she can only ever love her husband. In the meantime, Harrison (im)patiently waits. ~ I’d pass out if I were allowed to see it. I’d die if I were allowed to touch it. Harrison is the drummer of the band, but I really think he missed his calling as a poet. The things that come out of this man’s mouth, or rather he states internally, will leave you in a puddle of swoon. There is such a sweet side to this man, and we haven’t even gotten into his role as a father! What you may not know, besides being a phenomenal drummer, and a man with a heart of gold, is that Harrison is a single father. He was blindsided with this role, but from the beginning has handled it like a pro. He and his son Quinn have a relationship that would make anyone jealous. Quinn is wise beyond his seven years, and handles situations better than most adults. They are more than father and son, they are best friends. I could live a day without water if I was granted the permission to just stare at her. From the start of the book, we know how Harrison feels about Katelyn. What we don’t know is how or even if, anything will progress between them. Katelyn is so hesitant, so concerned with what everyone will think about her moving on. At the same time, she feels as if she is cheating on her deceased husband. He is all she has ever known, all she ever wanted. In an instant, without warning, he was ripped away from her, leaving Katelyn to raise two small children alone. She doesn’t know how to reconcile that her husband, the love of her life, her protector and best friend, is no longer in her life. To compound on all this, Peyton was a total daddy’s girl and has completely pulled away from everyone. I think your tattoos tell a story, maybe she should learn to read. I lean back and study my son. You’re right, maybe we can teach her. The conversations between Harrison and each of the kids are my favorite parts of the book. He speaks to them as equals and not just as children. The love he showers unconditional on Elle and Peyton will set your heart on fire. There are so many different facets to Harrison, and with each layer uncovered you fall in love with the man more and more. So much so that even though you sympathize with what Katelyn is dealing with, you just want to slap her upside the head! Because I want you to see me for who I am on the inside and not the out. It’s my security. What I love about this series is that there is no unnecessary drama. There is nothing farfetched, and these are all real life situations, dealt with like most people do. Death, love, career, raising kids alone, blended families, life after tragedy. These are all issues that everyone, at some point in their life, deals with in one way or another. Heidi approaches these with a realism and truth that allows you to believe you are there in the story with them all. It is not hard to envision yourself living in Beaumont, and I would love to take up residence there. Her body is the one drumbeat I can’t master, but I’ll never give up trying. To tell you how everything ends would be a major disservice to you the reader, as well as those of us who have already been on the journey with Harrison and Katelyn. I will say that this book is full of love, forgiveness, growth, friendship, and most importantly, family. Trust me, you will WANT to take this journey with Harrison and Katelyn. He is a not a man you will soon forget! I would highly recommend this series to everyone, and am so pleased to know that there are more books coming. Each book in the series is a continuation of the prior one, and should be read in order, but the main characters’ story wraps up at the end of them. I am waiting on baited breath for the next book, and this will surely be a series I return to in the future to read again.